We know that all that is involved can be daunting, but no matter how complicated the mortgage process might first appear, we will explain it all to you in plain terms, and provide you with all of the support that you need. Or you may be more experienced, perhaps looking for the best remortgage, raising capital to pay a deposit for your child’s first mortgage or you have an extensive Buy To Let portfolio. The mortgage market is ever changing, and having an expert on hand to give you information and guidance remains vital for you to reach an informed decision. 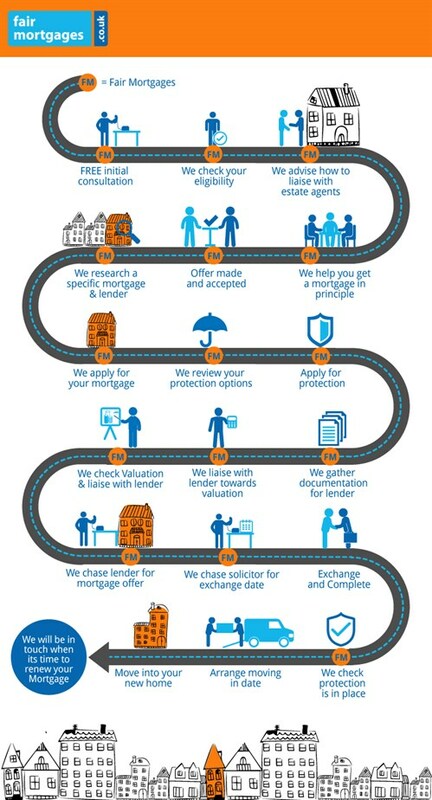 Whatever your experience, by using our service and speaking to our specialist mortgage advisers, you have made the right choice. Your mortgage is probably the largest financial transaction that you will ever undertake, and you should feel 100% comfortable with your decision at every stage of the process. Getting professional, affordable and reliable help to make the right choice can help to ensure this, so don’t try to navigate the mortgage jungle on your own! We know there is a vast amount of choice available to you, and that the search for the right mortgage can be very confusing. Our goal is to help you to make the right decision, as getting stuck with a mortgage that is not a good fit for you can have serious financial repercussions that you be tied to for a number of years. By the time you are reading this, you have no doubt already started looking around with a view to making your final decision, by Googling mortgage information and asking people you trust about their own experiences. Now is the time to get in touch with us, to have a quick chat about your circumstances and what is important to you. We offer a free, no strings attached, no pressure initial consultation, and will take some basic details from you before arranging a time for one of our advisers to get in touch. This can be the same day, during the evening, or at the weekend; whatever works best for you. We are confident that once you become familiar with our approach to working with you, and the knowledge and experience that our specialist mortgage and protection advisers can offer, you will be happy to retain Fair Mortgages to add value to your mortgage application process and beyond. When we have discussed your requirements and tackled any questions that you might have and you are happy to proceed, we will charge you a flat fee of £499. We believe that this represents excellent value for our service, particularly when compared to solicitors’ fees (£800-£1,000 or more), surveyor’s fees (£300-£750 or more) and mortgage lender fees (from £99-£1,500 or more). Good, reasonably priced advice will save you money; as they say, “if you think good advice is expensive, see how costly it can be to follow poor advice!”. We will demonstrate the potential cost savings that we can offer to you, and the future cost scenarios that you might face when you speak to us. Once you have retained our mortgage advice service, you will be appointed with your own mortgage adviser and a mortgage case handler, both of whom will work closely with you at every stage of the procedure and keep you informed every step of the way. If you have not yet found a property or have just seen the property you want and need to know with greater certainty how much you can borrow so can put in an offer, our approval in principle service is the best option. Get ahead of the rest by securing an approval in principle with a specific lender. Vendors often look for this when deciding on whose offer they accept – it’s not always on price, it’s often who’s ready to move quickly. For £199 you receive a certificate from us stating the maximum loan, giving you the peace of mind that you can put an offer in knowing that a mortgage would be available. We will also guide you through the initial stages of the house buying process and how to deal with estate agents – the dos and donts, what you really need to know and how to go about it. For those who have a deadline or who need enhanced service levels for whatever reason, our Fast Track service is the best option. Certainly trying to complete such a complicated transaction as a mortgage on your own, especially if timing is top priority, could prove costly. Whilst many lenders, banks and brokers are taking weeks simply for an initial mortgage appointment, you can speak to us immediately or if not we’ll call you back within 24 hours. We deal with your initial enquiry quickly, and aim to turn around the mortgage advice and recommendation within agreed timescales tailored to you. 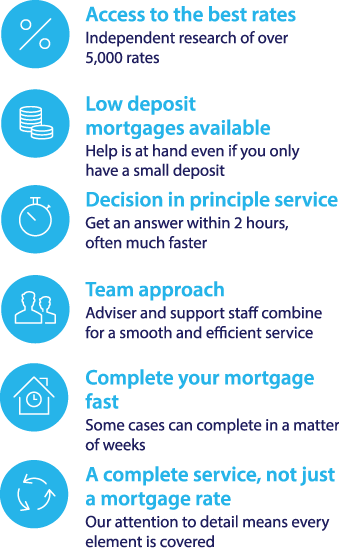 You will have two key designated points of contact from start to finish – your mortgage adviser and your case handler. We also have carefully selected conveyancers with national coverage and a chain of dedicated surveyors (independent of the lenders of course), all at competitive rates and working to market leading timescales. Our priority is you and your mortgage. You can track its progress and your details at anytime online. As an independent mortgage adviser, we have access to the UK mortgage lender market and over 5,000 different mortgage deals available, including many exclusive deals that are not available directly to the public. This means we can find the very best mortgage for you from all of those available. The experience of our advisers in combination with them having access to the whole mortgage market means we can cut through the fine print and explain the pros and cons of each product out there. This makes life easier for you, and allows us to tailor our recommendation to the best mortgage for your circumstances. Once we have found and agreed on the right mortgage for you, we will manage the application on your behalf, liaising with the lender to ensure that it is processed as quickly as possible. We will use our knowledge and experience in this area to ensure that the whole process happens in line with your expectations. We will of course keep you informed at every stage of the procedure, by phone, text and email; whatever works best for you. We will also provide you with access to our Life and Income protection service. Once your mortgage has completed successfully, we will stay in touch with you to ensure that you are happy with the service that we provided to you. We will also agree a future time to contact you, to provide you with options going forwards when your existing mortgage deal comes to an end, in order to help you to keep your mortgage costs down and pay off your debt as soon as possible. Why not go direct to a lender or a fee-free broker? You might be thinking ‘Surely the cheapest rates are online?’. It is entirely possible to look online for the lowest mortgage rate, find a fee-free mortgage adviser or attempt to negotiate directly with the lender, and we do encourage you to consider these options. However, when it comes to getting sound advice and experienced guidance on which route you should commit to when buying your mortgage, you need to speak to Fair Mortgages to help and advise you and make sure that final decision is indeed the right one. Plus don’t forget, our service does not stop when you get started. We continue to offer an ongoing support service to our customers, by offering regular reviews of your mortgage and protection requirements. Understandably, the seemingly-lowest percentage rate available to you might appear to be the most appealing, but this might not be the perfect fit for your property. For example it may not be available to you in the area where you live, or allowable for someone with your income and monthly spending habits. It also might not offer you the option to remortgage in the timescales you require, or allow you to let the property out at a later date if you wish to buy another property and rent your current home some way down the line. There are numerous factors to consider as part of your mortgage-buying decision, and the lowest rate or cheapest fee is just a couple of them. We will help you to understand the whole range of factors that make up the right mortgage choice for you, and provide you with all of the information and advice that you need to make an informed decision, and one that you will be happy with in the future as well as right now. Fair Mortgages offers a fresh and dynamic approach to the mortgage advice process, developed around the current mortgage market and the changing needs of customers. The foundations of our service are built on the knowledge and experience of our mortgage and protection specialists, working closely with our experienced support team. Fair Mortgages Limited is an appointed representative of Fair Investment Company Limited, who are authorised and regulated by the Financial Conduct Authority (FCA). Fair Investment Company Limited was established in the year 2000, to provide a range of online financial services and products to the UK market. Our clients include individuals, business, charities, trusts, pension schemes, and clubs and associations. We are specialists in gathering a full understanding of our customers’ needs, understanding the modern demands on delivering financial services and developing a first-class service around them.